1. What Types of Sources Can I Use? 3. Can I use this source? Bibliography: A bibliography is a list of sources about a single topic. Each book listed in the bibliography is identified by its Author, Title, Publisher, Place of Publication, and Date of Publication. Articles from newspapers, journals and magazines include the title of articles, the authors, the journal or magazine where it was published and the volume, issue number, the date of the publication and the pages the article appeared on. Each discipline has its own style for creating bibliography entries. Primary Source: Primary Source is used to describe several different types of sources. In the Sciences a Primary Source is an original research article. In the Humanities, a primary source could be the text of a novel or it could be an artifact like a map or a diary. Scholarly Source: Scholarly sources are different from news sources because rather than reporting an event, scholarly sources ask and answer questions through some form of analysis. Scholarly sources are written by experts-- people who know a lot about their subject like professors-- and they also refer to other sources in a works cited/references list to show where their information came from originally. 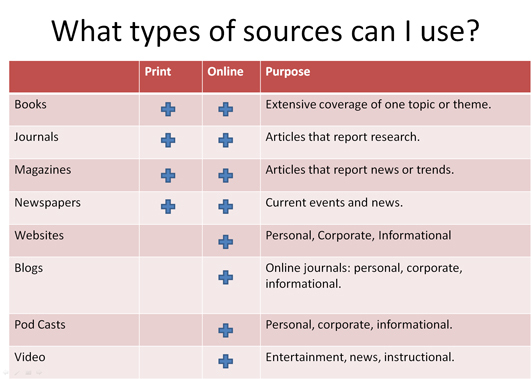 Selecting relevant sources is more than finding the type of source that is required and it is more than finding a source that contains your keywords. As the researcher you will want to select sources that enable you to engage a question or a problem. A list of required sources will help you envision what a good bibliography will do: show your reader the depth and breadth of your research. Gathering all of the required sources for an assignment does not substitute for engaging with sources in your writing. A well researched paper will converse with the ideas and information presented in sources. Scholarly writers engage with the work of others through the strategic selection of research and ideas pertinent to the question or problem under discussion. 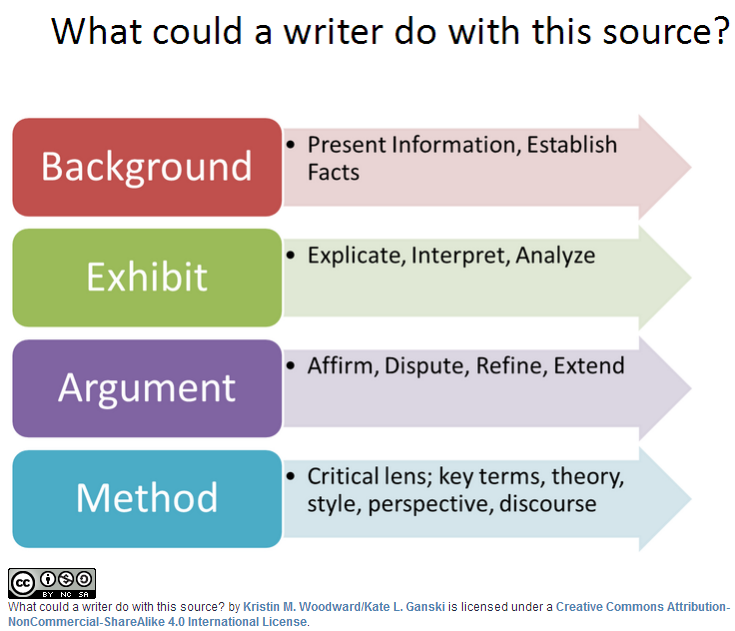 When trying to decide if a source is pertinent to your question, it can be helpful to ask yourself: What could a writer do with this source? Could this source provide background facts or information? Could I analyze or interpret this source for my reader? Could this source refine my question or extend my thesis? Could this source be a lens for interpreting competing findings? A paper that cites a lot of background sources will be a boring report. A paper that cites a lot of argument sources without including an exhibit runs the risk of rehashing the ideas of others instead of applying the ideas of others to new questions or contexts. The contents of the Information Literacy Tutorial may be reused with attribution. Please copy the following into new works based on the Information Literacy Tutorial. Information Literacy Tutorial by Board of Regents of the University of Wisconsin System is licensed under a Creative Commons Attribution-NonCommercial 3.0 Unported License.